PotatoStock 2014: A benefit concert driven by the unusually successful Kickstarter campaign for Potato Salad. First, there was Woodstock. Now, there’s PotatoStock. Specifically, PotatoStock 2014, a benefit concert driven by the unusually successful Kickstarter campaign for Potato Salad by Zach Danger Brown. Unlike most Kickstarter projects Brown’s Potato Salad garnered massive media attention due to its idiosyncratic funding goal of $10. The campaign would continue to surpass Brown’s potato dreams. He managed to gather $55,492 from 6,911 backers. We have a giant outdoor space reserved (The Columbus Commons) for September 27th, 2014, from noon to 8pm. The show is free and all proceeds from selling concessions will go to a permanent fund to end hunger and homelessness in Central Ohio. Brown is still seeking a headliner, so all potato salad musicians are encouraged to participate. As for the rest of the pledge benefits, Brown will actually fulfill them as promised. 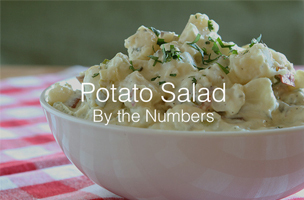 Yes, he plans to “say your name out loud while making the potato salad.” That’s 1,253 names! Backers who wants a bite of the potato salad will have to come to PotatoStock 2014. Potato salad guy @ztbrown throwing PotatoStock concert on 9/27 in Columbus to help homeless. Sponsored by @IdahoPotato and @hellmanns!